My familiarity with The Franks, funny enough, began in Los Angeles at a little restaurant called Animal. So upon visiting Prime Meats with NYU grad student Nancy, I had experienced the imported version of Italian food originating at Frankies 457 – immediately next door. 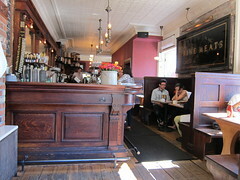 But that lunch, after my vintage hat box purchase at the Brooklyn Flea Market, would instead be German.Â Prime Meats’ menu is intact with The Franks’ restaurantÂ philosophy,Â with housemadeÂ items and farm-to-table ingredients. The servers wear suspenders, cuffed jeans and pin-striped shirts; I had never been inside a German restaurant that had so successfullyÂ turned “dingy” on its side to yield “hip.” And here we were. Brooklyn. It was a beautiful, sunnyÂ day when we visited,Â and natural light flooded the doubly-expanded, distressed, wooden interior. Though our fellow diners seemed to prefer breakfast, Nancy and I both settled on lunch. 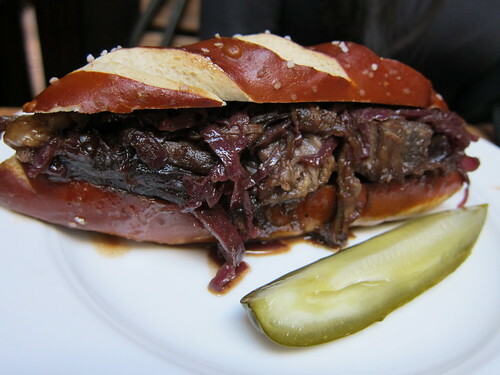 I was eager to try another interpretation of the German influencesÂ that had been so prevalent inÂ my Midwest upbringing – or at least experience the Brooklyn,Â artisanal approach to it.Â Nancy’s Sauerbraten was dressed with braised red cabbage and came with a side of Bavarian mustard. The housemade pretzel braid that encased the sandwich, however, was key. I may have stolen a bite when she went to the bathroom, and had tried to refrain from asking for that third orÂ fourth bite once she returned. That is my confession. That’s not to say that I was in the least bit dissatisfied with my serving of Weisswurst – made with minced veal and pork bacon. 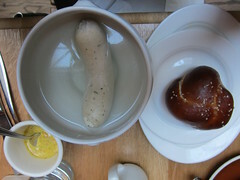 The server helpfully divulged that typically, the wurst is opened and the interior spooned out onto a roll – but that this housemade version was completely edible, inclusive of casing. And he was right. It steamed as I cut it open and its texture inside was perfectly tender yet bouncy to the bite. I was really blown away by the mustard (also made in-house, of course) withÂ its potency and subtle sweetness. This is definitely a place that I would slate for aÂ re-visit with purposes of trying more selections on the menu. It’s also a restaurant that would inspire me to call Brooklyn my home should I ever move to the East Coast, what with Prime Meats’ kitchen open until 1 or 2 AM. (It could be that early kitchen closing time is just an L.A. thing – grrr.) The prices are more than reasonable, staying true to making artisanal andÂ simply prepared food accessible. Who knew that probably my favorite, casualÂ German restaurantÂ would beÂ in Brooklyn? This entry was posted in beer, Food, lunch, New York and tagged artisanal, bratwurst, Brooklyn, Carroll Gardens, Food, Frank Castronovo, Frank Falcinelli, Franks, German, lunch, new york, NY, pretzel bun, Prime Meats, sauerbraten, The Franks, weisswurst. Bookmark the permalink.